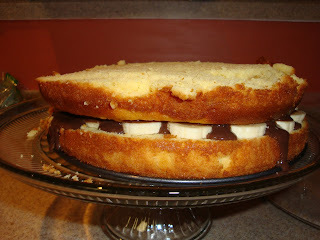 Tonight I made my first feeble attempt at a layer cake! And will also make my first feeble attempt at food blogging, complete with photos and all. Whoop Whoop Whoop (Arsenio arm pump) Go me! I was kind of making it up on the fly, here's what I did! Start out making a yellow super moist boxed cake. (Yes, I used a boxed cake mix!) 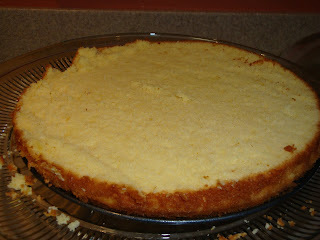 After it was baked and cooled, cut it in half across the middle of the cake. And why not, some chocolate pudding too! Then put the top back on, but upside down to have a nice, smooth Will Smith flat top. Now the frosting! I whipped up some heavy whipping cream with a bit of confectioners sugar. 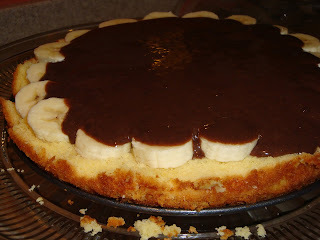 I also added a little coconut around the sides to hide my messiness. Finally~ A flower to make it a little Carrie Bradshaw-esque. Good start, NoM! Love the final flourish, the CB flower and glass cover. 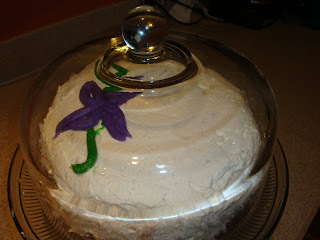 To cover the messiness, or rather, fix it: Let the frosting rest on the cake for about ten minutes. Take a napkin or paper towel and gently press down to smooth frosting so there are no knife marks/swirls. 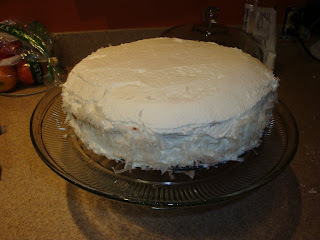 I hate coconut and would hate to see you rely on THAT for the rest of your baking life! I think I learned this trick from one of my cake decorating classes at JC Penneys. It does look good! I love coconut. I have since learned, skip the Will Smith flat top. 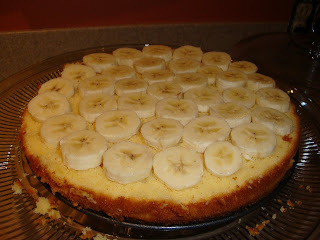 Put the top back on the cut side down and line it up with the bottom of the cake.